•Time constants in a simple CR circuit. After about 5 time constant periods (5CR) the capacitor voltage will have very nearly reached the value E. Because the rate of charge is exponential, in each successive time constant period Vc rises to 63.2% of the difference in voltage between its present value, and the theoretical maximum voltage (VC = E). Therefore the 63.2% becomes a smaller and smaller voltage rise with each time constant period and although, for all practical purposes VC = E in fact VC never quite reaches the value of E.
THE TIME TAKEN FOR THE VOLTAGE ACROSS A CAPACITOR TO INCREASE BY 63.2% OF THE DIFFERENCE BETWEEN ITS PRESENT AND FINAL VALUES. a slightly more complicated definition, but this provides a much easier formula to remember and to work with, T = CR. 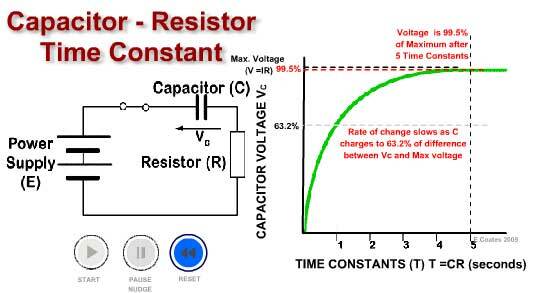 When the capacitor is discharging the same CR formula applies, as the capacitor also discharges in an exponential fashion, quickly at first and then more slowly. During discharge the voltage will FALL by 63.2% to 36.8% of its maximum value in one time constant period T.